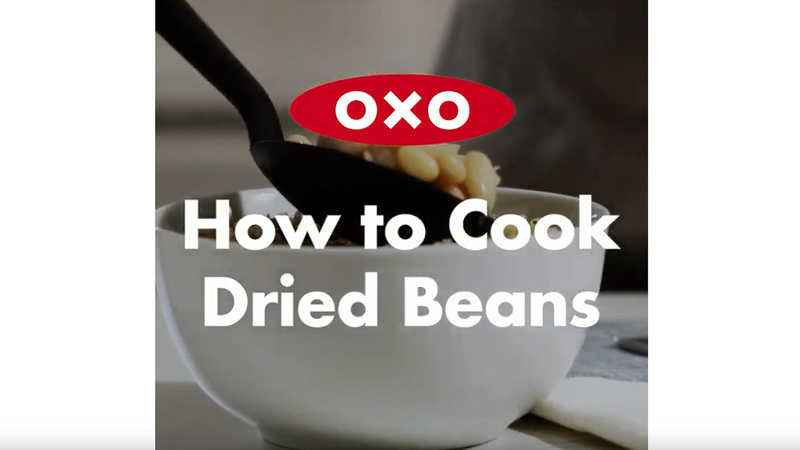 A guide for how to make dried beans, plus a super simple recipe for creamy beans from scratch. Always have beans. Their virtues could fill many pages. They’re economical, nutrient-dense, packed with fiber, good for the gut, ecological, filling, and extremely tasty in many forms. What I especially want to say about beans today, is how easy it is to cook them. 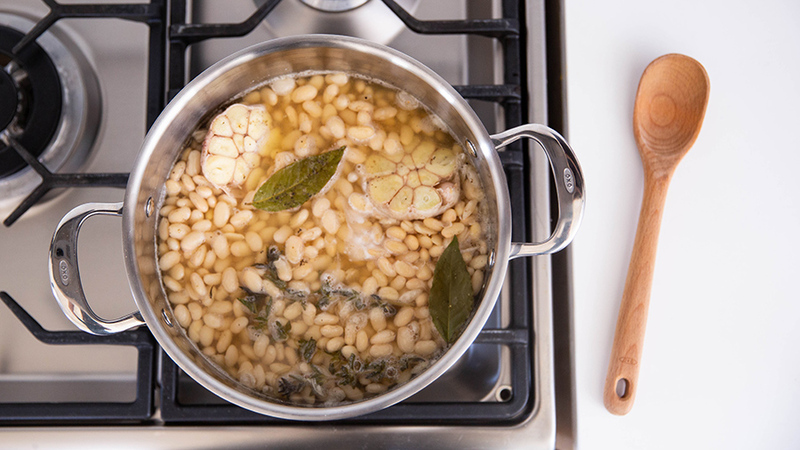 Dry beans are like slow-motion pasta: Put them in water with salt and simmer them until they are soft. Cooking dried beans is so easy and their flavor so good that I wonder why canned beans are even popular. Unless there is a time-sensitive bean emergency, dried beans are the way to go. Beans, whatever the type, cook in basically the same way. Factors such as size, the thickness of their skin, and their date of harvest affect how vigorously you should cook them and how long before they are tender enough to eat. There are a few bean do’s and don’ts to keep in mind. Soaked beans hold their shape and have a creamier texture than unsoaked, in my experience. You don’t have to do it, but since soaking is passive and helps beans cook faster, why not? Salt the water because it plumps and seasons the beans inside. Skip the soak and bring beans in liquid to a boil, then turn off the heat and wait about an hour. Then, add about an extra hour of cooking. Or use a pressure cooker. People who eat beans often are able to digest them more easily. Joke as you like, but I’ve not found convincing research to support the theory that soaking beans reduces gas. Just eat more beans. Salting beans while you soak them does not toughen their skins or make them split, in my tests, but it does make them more flavorful, because salt seasons the water that they absorb while they soak. The harvest date of a given bean affects how quickly they absorb water and soften. Most of the time, harvest info is not available. Just cook them for 45 minutes and start tasting or squish one with a fork to see if they are done. When a bean yields to gentle pressure and it’s lost its dry, squeaky texture and green flavor, it’s ready. Not all beans cook at the same rate. Little, thin-skinned lentils can cook in 30 minutes, while a kidney bean harvested last year might take a couple hours. Follow pressure cooker instructions for beans for super speed. Just make sure not to go above the max line for liquid, and add a tablespoon of oil to keep the foam down. Slow cookers are another ideal way to cook beans. Adding acids like lemon juice, vinegar or tomato sauce to beans while they cook noticeably slows down cooking time. Add acids at the end. 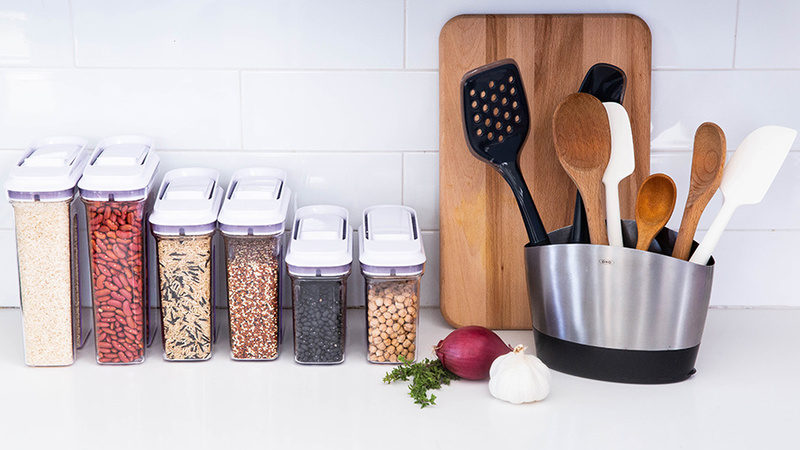 Avoid mixing beans purchased at different times from different places in the same batch. Please avoid burning beans. That really wrecks them. Improvise and make your beans amazing: Beans are a staple in so many cultures and complement most flavorful cuisines. Try one these if you are in a slump: Add 2 cloves crushed garlic, cumin seeds, red pepper flakes, chipotle in adobo, oregano, sliced ginger, soy sauce, barbecue sauce, broth or thyme. Bake them, soup them, refry them, put them in salads, blend them in dips, build stews around them, or invite everyone over for a bubbling pot of chili. 1 pound dry beans, such as black, pinto, cannellini, black-eyed peas, etc. Rinse beans and pick them over to remove discolored ones or small stones. Put beans into a bowl with 1 tablespoon of the salt and 6 cups water and set aside to soak for 2 to 12 hours. Drain and rinse beans. Put them in a large, lidded pot with the teaspoon of salt, black pepper, bay leaves, onion and enough water to cover them by an inch or two (about 6 cups). Bring to a boil. Skim and discard foam. Cover, reduce the heat and simmer until beans are tender and creamy inside and their skins are still mostly intact, 45 minutes for small beans to 1½ hours for large or older beans. Serve hot with some of the cooking liquid, or store in cooking liquid in the refrigerator for about 3 days or in the freezer for a month. When I was a child. On Friday’s during lent. We would often have beans. My mother would add onions and celery. When they were tender she would add rivles. Or as you might call them dumplings. We loved them. It was a good nutritional and inexpensive meal. We usually added some good bread and butter. Enjoyed your article about dried beans, but I do take issue with your comment that adding salt to beans while cooking doesn’t toughen them – my friends and I say it does! However, this problem can be avoided by adding 1 teaspoon of baking soda while soaking them overnight. Love your posts and love oxo!